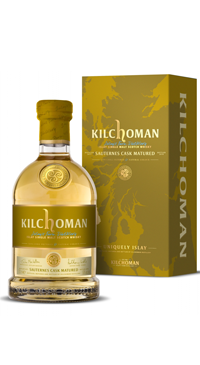 This is Kilchoman’s first release of a Sauternes Cask Matured Scotch; it is a limited edition release of just 6,000 bottles. This single malt scotch has been fully matured for over five years in Sauternes casks. The Sauternes Cask Matured follows Port and Madeira cask matured expressions released in recent years and continues Kilchoman’s commitment to small batch ‘full term maturation’ rather than the more common practice of finishing whisky in such casks for a short period prior to bottling.